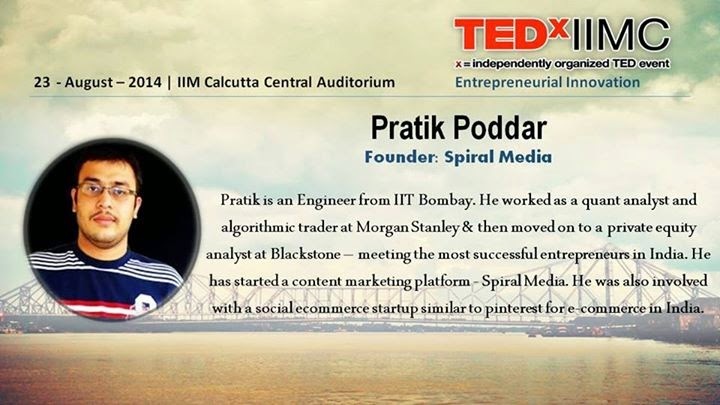 Thanks to Abhishek Katiyar, I was invited to TEDx IIMC to share my experiences around entrepreneurship. Given that my story has been a bit hazy and incomplete yet, I did not want to share the story, instead I wanted to just talk about the key learning from the short experience I have had till now. It was great meeting super passionate speakers - Fahim and Tousheef, Krutika and Sumit. I had a great afternoon. Thanks for the opportunity and hospitality. I hope it was useful for some people at least. How many of you here want to be entrepreneurs? Why? Money/ No boss/ Impact/ Hip thing to do? I my last 2.5 yrs experience with failed startups, I have not got any of these, but still I am happy with the journey so far. Why am I happy? A mentor of mine once said to me that life is nothing but sum of all experiences. I think that because of the start-up experience, I now see life from a different lens altogether. So this is what I will talk about. Stopping for a second to look back at my startup journey - some points in no order. 1) Marketing and sales are important - even for tech startups. Nothing sells itself. The movie Social Network did not talk about it. Its not only about the product. "Bijnessman wahi hai jise bechna aata ho"
2) Accept failure quickly, learn from your mistakes and iterate fast. "Subah ka bhoola shaam ki jagah agar din mein hi ghar aa jaye to behtar"
3) Do not fuss about equity. Be equal partners and go ahead. "Ye dosti hum nahin todenge"